Our Dorset GM Neil recently celebrated his 20 years at the hotel at a surprise party thrown by his loyal staff. We asked him to look back over this career at Moonfleet as well as share his plans for the hotel with us. Neil, what originally brought you to Moonfleet and what was your background prior to that? I joined Moonfleet after opening and running my own Mexican restaurant in Bournemouth for just over a year. Our favourite saying was: “If you can’t say it, you can’t have it!”. Before that I worked in hotels in various locations, as well as having a three-year sojourn abroad on privately owned motorboats. It’s a long time ago now, but can you remember your first impressions of the hotel? It was mid December and it was VERY cold! The water on the Fleet was frozen. I’ve never seen that since! How has the hotel changed over the years? An enormous amount changed in the first three years as we set about refurbishing the hotel and changing the clientele. Strangely though, a lot has stayed the same. The most notable change, for me, is how the team have got better year after year, despite so many great people coming and going. What do you think your greatest achievement at the hotel has been to date – what are you most proud of? 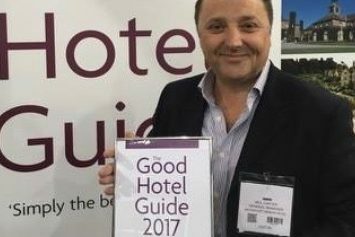 I have been proud to lead a team of fab people who have made Moonfleet the most-visited hotel in the Luxury Family Hotels group. What are your favourite things about the hotel? The view of course! It never fails to take my breath away. I love how it changes through the year as well. And what about your insider tips for those visiting Dorset? Crikey, where do you start?! Fossil hunting at Lyme and Charmouth, sandy beaches, little coves, smuggling stories, castles, steam trains, sailing… There’s just so much to do. What are your plans for the future of the hotel? What has kept me at Moonfleet so long is its undoubted potential. It has all the ingredients to be extraordinary and hopefully we can grow the hotel and its facilities and keep to our aim of becoming the best family hotel destination in the UK. Lastly, can you tell me what you think are the main ingredients of a truly family-friendly hotel? Empathy goes such a long way. And so does outstanding hospitality with a sense of humour. If we can continue to understand our guests’ needs just before they do, and deliver service with genuine warmth, then we won’t go far wrong. Read more about family breaks in Dorset at Moonfleet Manor.